Raleigh-Durham International Airport (RDU) lost its hub status before the onset of the economic downturn and consolidation among the large US major airlines. But during the last few years its traffic levels have remained stable, driven in part by the metro area hosting numerous educational and research facilities that help to sustain a certain level of origin and destination traffic. The airport is adding new airlines in 2015 including Allegiant and Alaska Airlines, expanding Raleigh-Durham’s (RDU) offering to the US West Coast and Florida. United is also resuming service to Denver, and Southwest is adding service to Dallas Love Field. All of this bodes well for Raleigh-Durham to maintain or grow its current passenger levels. Undoubtedly the ultimate prize for Raleigh-Durham is additional long-haul flights beyond its current service to London Heathrow. But similar to other US non-hub airports, Raleigh-Durham understands the competition to gain additional service is fierce, and securing new long-haul routes is a lengthy and challenging process. American Airlines opted to shutter its hub in Raleigh-Durham in the mid-1990s. Even at that time making a hub viable in Raleigh-Durham was tough as US Airways and Delta had hubs in Charlotte and Atlanta. But RDU over the last few years has maintained stable passenger levels during a time that other airports – Pittsburgh and Memphis – that lost their hub status when consolidation started sweeping the US in the mid-2000s. 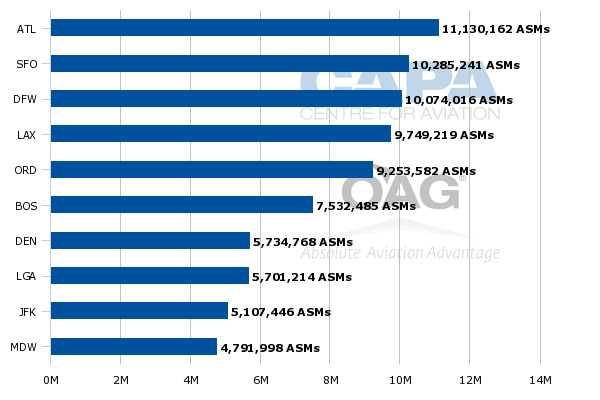 All small to medium sized airports are working to establish their roles in a post-consolidated environment where the three largest airlines represent roughly 47% of the seats on offer for the week of 25-May-2015 to 31-May-2015. 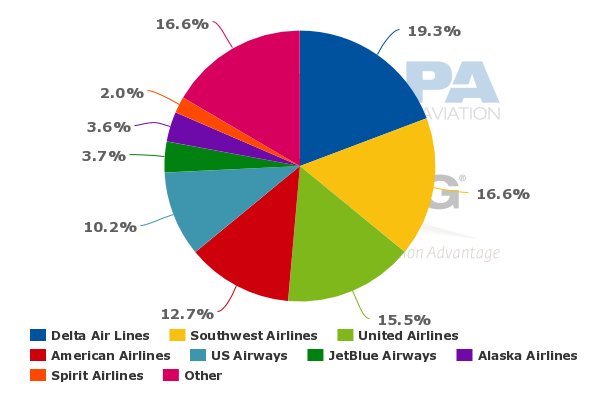 If Southwest is included, then the seat concentration among the four largest US airlines grows to 74%. The 3.8% passenger growth RDU recorded in 2014 was the highest increase during the last few years. 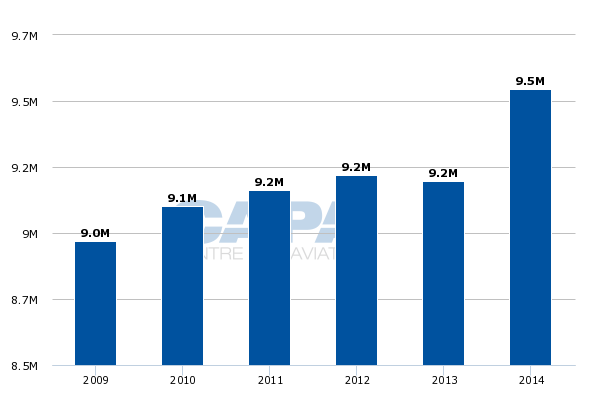 The 9.5 million passengers that travelled through the airport was the highest since 2009, but still below the 9.7 million travellers utilising RDU in 2008. RDU recently welcomed Allegiant Air as a new airline serving the airport after the launch of service to Orlando Sanford, Punta Gorda and St Petersburg/Clearwater, Florida. United is also planning to resume service to Denver in Sep-2015 from RDU after ending a brief stint on the pairing in 2007, joining Southwest in operating on the route. The airport estimates that roughly 500 passengers travel between the two destinations daily. Southwest, which is RDU’s second largest airline measured by seats and ASMs, is also launching new flights to Dallas in Aug-2015. Frontier Airlines is also operating seasonal fights to Chicago O’Hare. Rounding out the new service roll-outs from RDU in 2015 is the launch of daily nonstop service to Seattle by Alaska Airlines. At the time it outlined plans to launch the route, Alaska stated it was linking two biotechnology hubs. In early 2015 ratings agency Fitch concluded that RDU’s service area, which encompasses the North Carolina Research Triangle Region, “is characterised by high income levels, lower than average unemployment and strong population growth”. The agency also highlighted that RDU “maintains a competitive cost position with an average CPE [cost per enplanement] of USD6.92”. Once Alaska begins its service to Seattle, RDU’s service profile to the US West Coast will expand to three destinations. Presently, the airport’s West Coat footprint includes services to Los Angeles (operated by Delta and US Airways) and San Francisco (operated by United). In Mar-2015 the Executive Director of the local Regional Transportation Alliance Joe Milazzo told WUNC.org that five or six years ago, RDU had no service offerings to the West Coast. 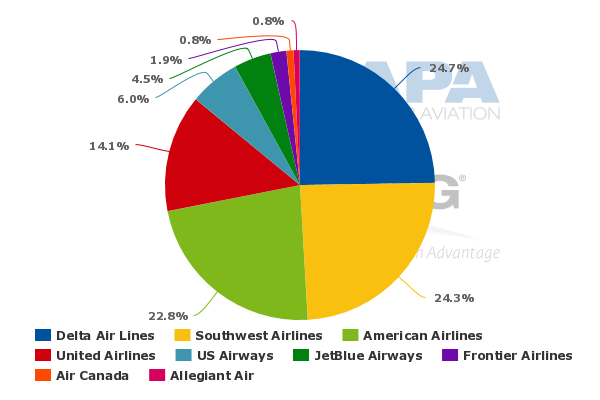 Data from CAPA and OAG for the week of 25-May-2015 to 31-May-2015 show that San Francisco and Los Angeles are RDU’s second and fourth largest domestic markets measured by ASM deployment. 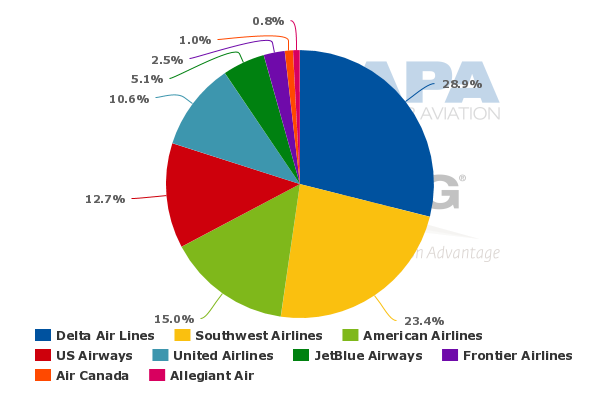 RDU’s current international offerings are London Heathrow (operated by American), Toronto (offered by Air Canada) and Cancun (operated by Delta once weekly and ending the week 25-May-2015 to 31-May-2015, according to schedules from CAPA and OAG). The airport is obviously working to gain more long-haul service, but it is admittedly a challenge. RDU CEO Michael Landguth told WUNC.org that similar sized markets including Memphis, Cincinnati, Pittsburgh, Austin, San Jose and Nashville are also competing for long-haul service. Memphis, a former Delta hub, lost its long-haul service to Amsterdam in 2013. Delta has been pulling back in Memphis and its hub in Cincinnati and redeploying some of the capacity to Seattle. Austin scored a victory in 2014 with new service from British Airways to London Heathrow, and is obviously working to gain additional long-haul service. Delta for many years has operated seasonal flights from Pittsburgh to Paris, and has resumed the flights in 2015. In his interview with WUNC.org Mr Milazzo highlighted a study conducted by the state of North Carolina showing that adding service from RDU to Paris or Frankfurt would generate roughly USD1.4 billion in economic impact over 25 years. Paris could be a viable option since SkyTeam anchor member Delta is RDU’s largest airline and its alliance partner Air France is the largest airline operating from Paris Charles de Gaulle. But Delta at the moment appears to be working on leveraging its new joint venture with Virgin Atlantic to maximise its presence in the London Heathrow market, and plans to cut its international capacity during the 2015-2016 winter season. Europe’s economy still remains tenuous, so it is unlikely that Air France aims to launch service to a smaller non-hub US airport in the immediate future. Those same economic conditions are also likely preventing Lufthansa from giving serious consideration to brand new long-haul flights to the US. 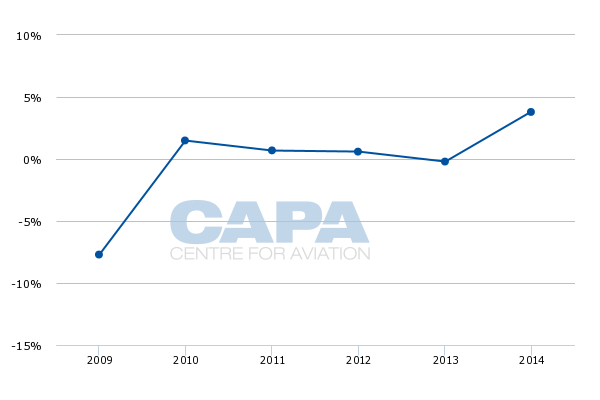 Lufthansa was one of the first airlines to highlight industry oversupply in the trans-Atlantic market during mid-2014. Despite facing competition from numerous non-hub airports that are working to make themselves attractive to both US and foreign airlines for additional long-haul service, RDU's passenger levels have not dropped as dramatically as Cleveland or Cincinnati during the last three to four years. In many respects, RDU was fortunate in being forced to remake itself long before the effects of the last round of airline consolidation in the US set in. As it works to position itself as a viable candidate for additional long haul flights, RDU is attracting a solid mix of new domestic service from both major, hybrid and low cost airlines. That is a trifecta many US airports are attempting to attain as they remake themselves in the consolidated US market place. And, as is so true in a network-oriented aviation industry, nothing succeeds like success.